I found myself discussing The Open’s television rights on twitter earlier today. This got me thinking a little more about the merits of the British Broadcasting Company (BBC) and the most obvious alternative Sky Sports. The current United Kingdom (UK) television contract for The Open expires after the 2016 Championship that is to be played at Royal Troon next year. The Daily Telegraph reported earlier this month that Sky Sports may be close to securing the next set of rights to The Open which in turn has started a debate that shows no signs of abating. Some believe a confirmatory announcement may even be just a few weeks away. Firstly I should point out that it is very difficult to draw firm conclusions on this matter without knowing the sums offered by all of the interested broadcasters and also having an idea of the likely viewing figures that each channel will attract with it’s coverage. Such data is of course not in the public domain. Recent renewals have seen The R&A increasingly have to walk a tightrope when considering The Open’s highly prized UK broadcasting rights. On the one hand, do they seek to maximise television coverage and publicity for their premier event hoping this will encourage interest and participation. Or on the other, do they choose a partner willing to pay the contract’s full market rate, thus enabling them to increase investments into the development of the game both at home and around the world. What’s best ? High exposure to the public whose viewing (and subsequent participation) is still voluntary versus lower potential TV figures but the cash to allow focussed investment in clubs, communities and golfers. The above debate boils down to the merits of the free-to-air BBC and the paid-for alternatives, Sky Sports or potentially the newer BT Sport. 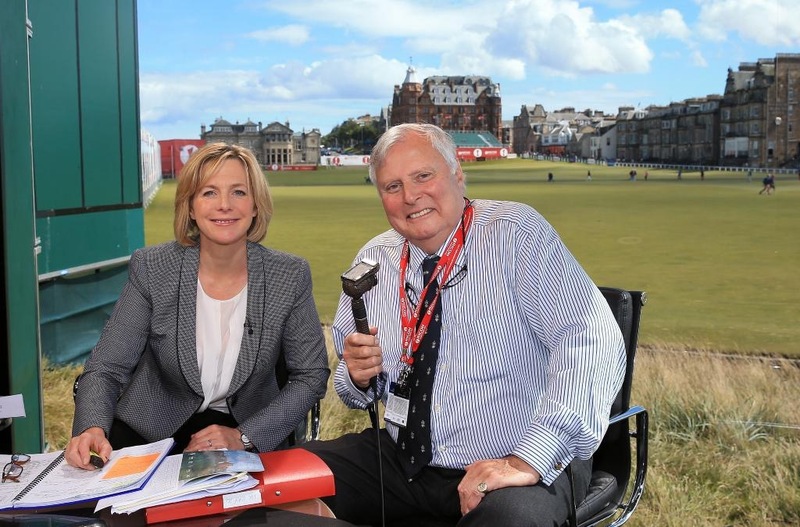 The BBC clung onto the rights at the last review with little more than history and potential viewers to offer The R&A. The BBC have covered The Open forever – since 1955 to be precise. Peter Alliss, the voice of golf in the UK, has commentated on it since 1961 and has enjoyed the lead role since 1978. We also shouldn’t forget the excellent job the Corporation does on the radio via their Radio 5 Live channel – not that this is under threat here. A professional job can be guaranteed but with their coverage of sport rapidly declining, largely due to budgetary constraints, it must be coming less attractive for them. Likewise it isn’t easy for viewers to build a rapport with presenters and analysts who nowadays show up in their living rooms just once a year. What is currently unclear is just how hard the BBC are fighting for The Open. Surely they can’t expect the R&A to again hand over the rights for a pittance when other organising bodies continue to enjoy lottery wins for their sport’s contracts. What can not be denied is that the BBC have allowed golf to drift away from their schedules over the last 10 years despite the UK enjoying an unprecedented group of world class players, almost for the first time in modern history. Losing the rights may also help them deal with the Peter Alliss question – how long should he go on and who can replace him ? Sky have increasingly become a very credible threat to the BBC’s historic pre-eminance. Their week in, week out coverage of both the European Tour and the US PGA Tour is admirable and of the highest quality. They also now enjoy live rights to the three other golf Majors, The Masters, The US Open and The US PGA. When one adds in the experience they have of covering other sports there can no longer be any question as to their credentials to manage The Open. The UK arrangement for The Masters may prove to be an interesting template for The R&A to adopt, with Sky taking the lead role but the BBC benefitting from highlights and some weekend live coverage. BT Sport can’t be totally discounted. They have ‘poached’ Premiership Rugby, Premiership Football, FA Cup Football and Moto GP coverage from Sky and the BBC in recent years and are said to have bid hard for the US PGA Tour rights at their last review. As a developing sports broadcaster in the UK they would be very keen to secure The Open given half a chance. However, this contract renewal may be too early for them to be a serious contender but their involvement will no doubt have kept Sky honest during this latest tender process. The R&A is often portrayed as an out of touch lawmaker and as simply a gentleman’s club but it has grown impressively in recent times. Commercial activity at The Open has developed greatly, firstly under Sir Michael Bonallack and more recently under the leadership of Peter Dawson. The retirement later this year of the latter is a further complication here too. Dawson may not want to go out with such a big decision and no doubt new Chief Executive Martin Slumbers will not be looking forward to dealing with the potential aftermath. So just how important is free-to-air coverage to the game of golf in the UK ? Many commentators believe it is of critical importance. Look at the recent victory of Lewis Hamilton over Rory McIlroy at the 2014 BBC Sports Personality of the Year awards as evidence of the need for more exposure and presence on terrestrial television they say. If people don’t watch it they don’t know about it. The complete removal of golf from mainstream television would be disastrous they believe, echoing the words of many in the cricket world which has experienced such a move. People will stop playing and new players will fail to emerge without Rory to inspire them like Seve did their father and grandfathers they argue. My view is that The R&A should hand the rights over to Sky. If golf is reliant on just four days of golf on the BBC every year for its future success then something is very badly wrong. Whilst I can see the link between terrestrial TV coverage and participation I am not persuaded it is that significant. Snooker and bowls are on the BBC a lot but I have no intention of seriously taking up either. I believe the results would be greater if the R&A took Sky’s cash and invested it in a focussed way into the game. By involving the National Unions and the Professional Golfers Association, and with local advertising, subsidised club memberships and school coaching schemes could be offered at a much higher level than currently. Golf has many more important issues to overcome to increase its popularity than the need to cling onto the BBC. Many of these need funds to enable them to be fully realised. Getting more women and children playing, making the game quicker (perhaps with more 9-hole courses), subsiding public / council-owned courses, helping old fashioned private clubs become more customer facing and developing new formats that attract new players all quickly spring to mind. It is time for change. I think Sky deserve a crack at it given their 365 day a year loyalty to the sport. They have earned it. I am also sure the additional funds generated can help the R&A to make more of a difference and grow the game. I don’t see what The R&A have to lose – the contracts are normally only short-term so if it doesn’t prove beneficial then they can go back to the BBC, ITV or Channel 4 if they want at the next review. Personally I doubt they will need to.